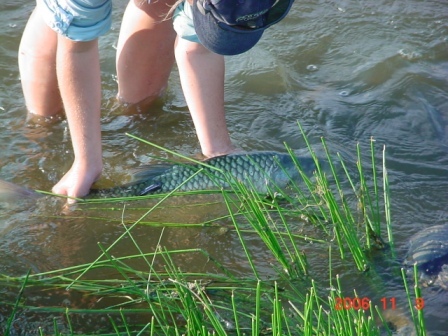 The Vaal Orange largemouth yellowfish (Labeobarbus kimberleyensis) and the Vaal Orange smallmouth yellowfish (Labeobarbus aeneus) are endemic to the Orange Vaal River system. The former is recognised as being vulnerable according to the IUCN Red Data Listing process. The latter is under high angling pressure. Both species are sensitive to water pollution, habitat destruction and harvesting pressure. They are both noted as being great angling species while from a conservation point of view they have been identified as charismatic sensitive indicator species. The study is therefore aimed at getting a better understanding of the behaviour of these two species in order to develop fisheries and habitat (river) management protocols that will enhance their survival and in so doing maintain a healthy ecosystem and a flourishing eco-tourism business. The study took place in a section of the Vaal River, which forms part of the overall Orange Vaal River catchments. The catchments covers Namibia, Botswana, South Africa and Lesotho. This will necessitate the development of management protocols in accordance with international standards. · To determine the home ranges of the two species. To determine how environmental variables (flooding, drawdown and temperature) affect the movement of these two species. The study site was on a section of Vaal River below the Orkney weir and before the Bloemhof dam. This section was selected because there was serious commitment to yellowfish conservation and to the project by the landowner. At a specific place in this section of the river most of the work will be done as there is good yellowfish habitat and large numbers of specifically Largemouth yellowfish were caught on a regular basis in this area. Largemouth yellowfish over a fork length of 45 cm have been used while Smallmouth yellowfish over a fork length of 30 cm have been used. This ensured that fish were sexually active. 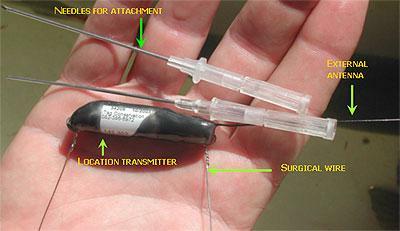 No fish smaller than 1.5 kg should be tagged as the weight of the tag may impact on their behaviour. An autumn/winter (May to October) tagging period was planned and a spring/summer (September to March). A full time researcher carried out the tracking, reporting and documentation.